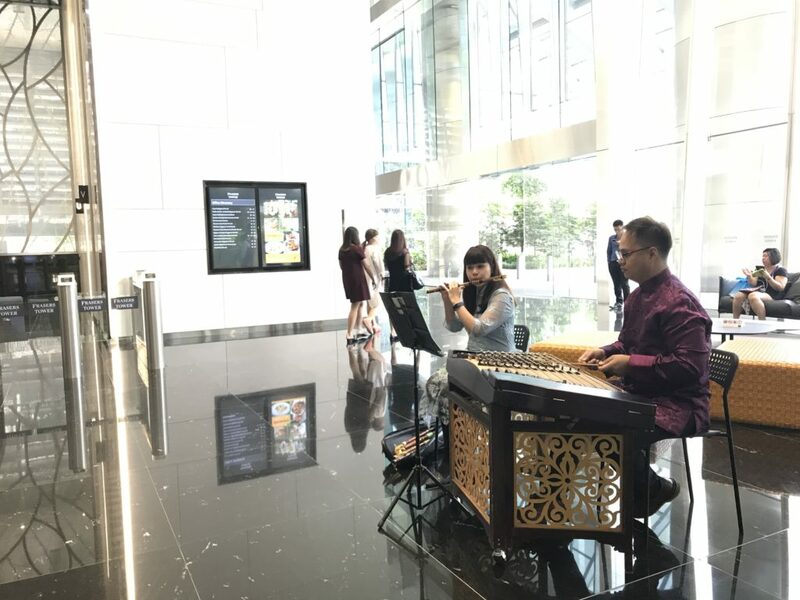 Every year during Chinese New Year period, we would get lots of enquires from corporates and individuals to engage our EM ensemble to perform. 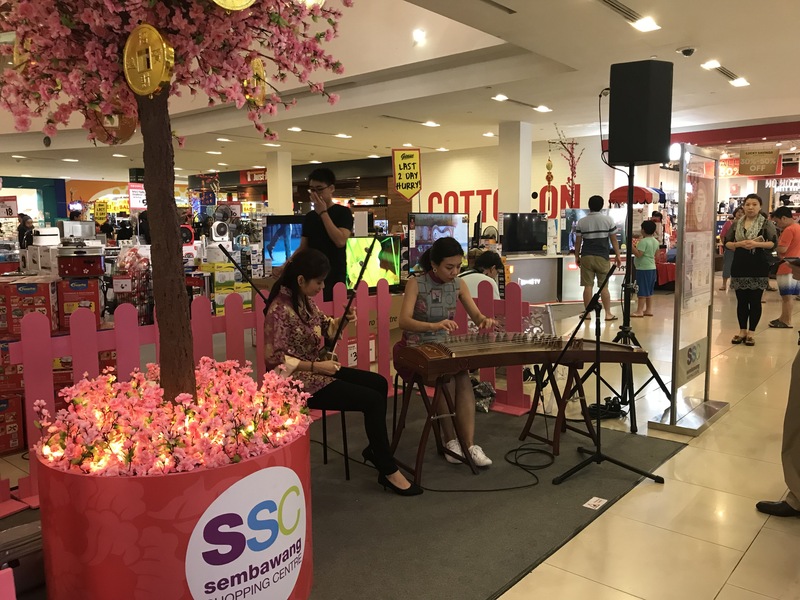 Traditional Chinese instruments playing Chinese New Year songs totally gives a festive feel to the event. 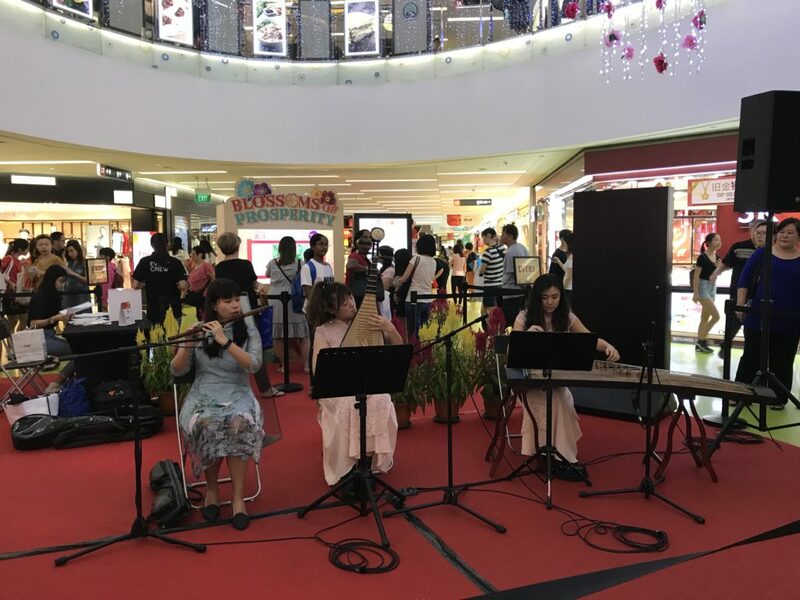 We had a series of performances at Square 2 shopping mall. 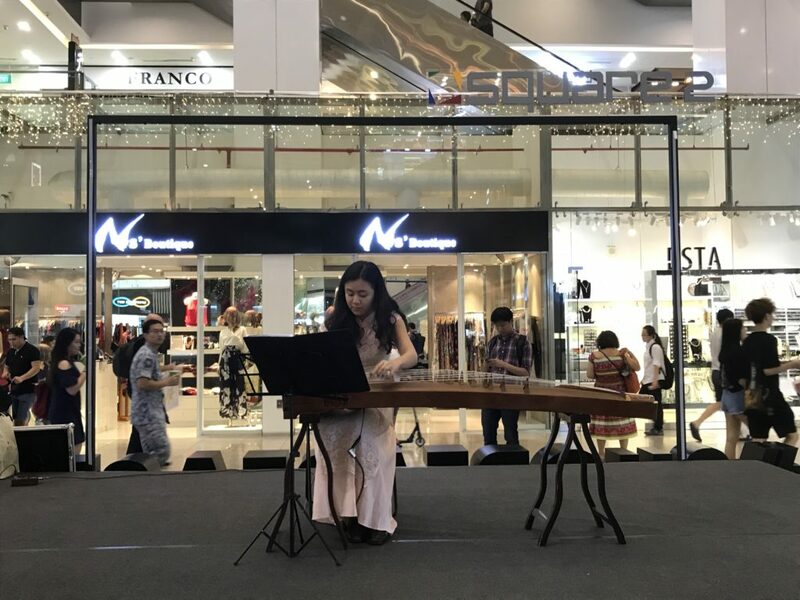 For 5 weekends, we entertained shoppers with some Guzheng solo performances, Guzheng Dizi Duet, Guzheng Pipa Duet, Yangqin Dizi Duet and Yangqin Erhu Duet. 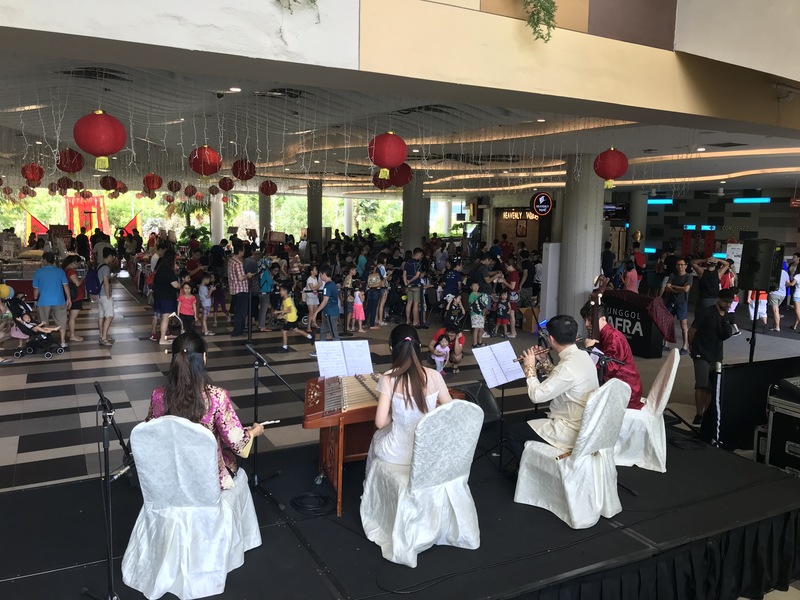 Our quartet was invited by Safra to perform some Chinese New Year songs as part of their CNY celebrations in Punggol Safra. 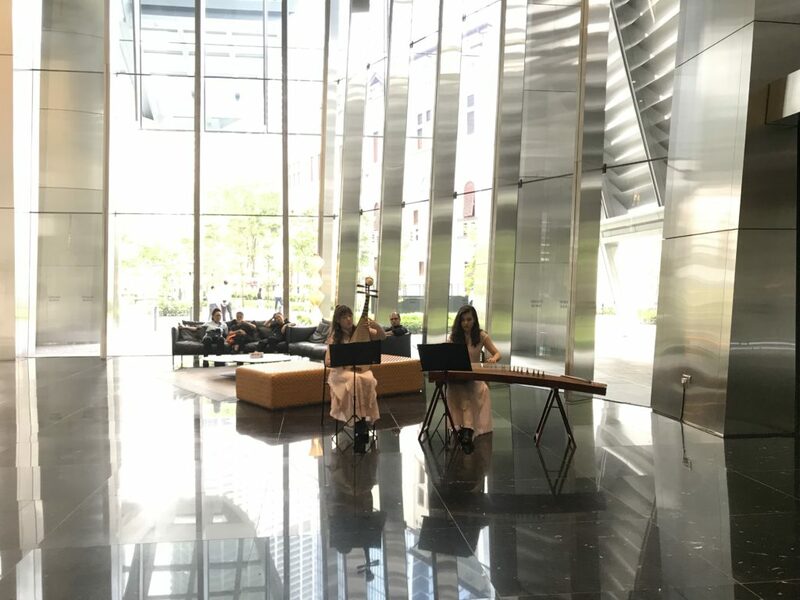 Our Guzheng Pipa and Yangqin Dizi duo performed for the lunchtime crowd of Frasers Tower. The tall ceiling gave a natural reverb to the music and no sound system was needed to fill the lobby with music. We were invited to perform at Chinatown point over the weekend. 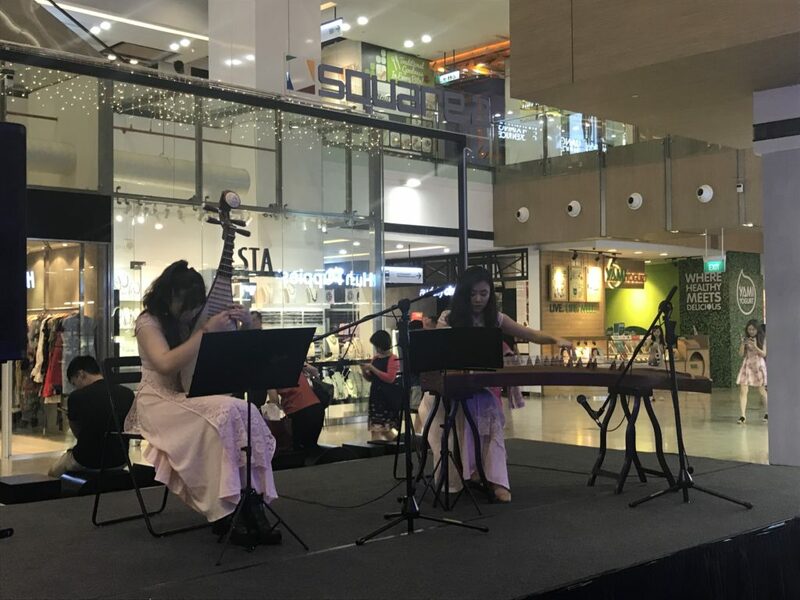 A less common pairing of Erhu Pipa was used along with the familiar pairing of Guzheng and Pipa. 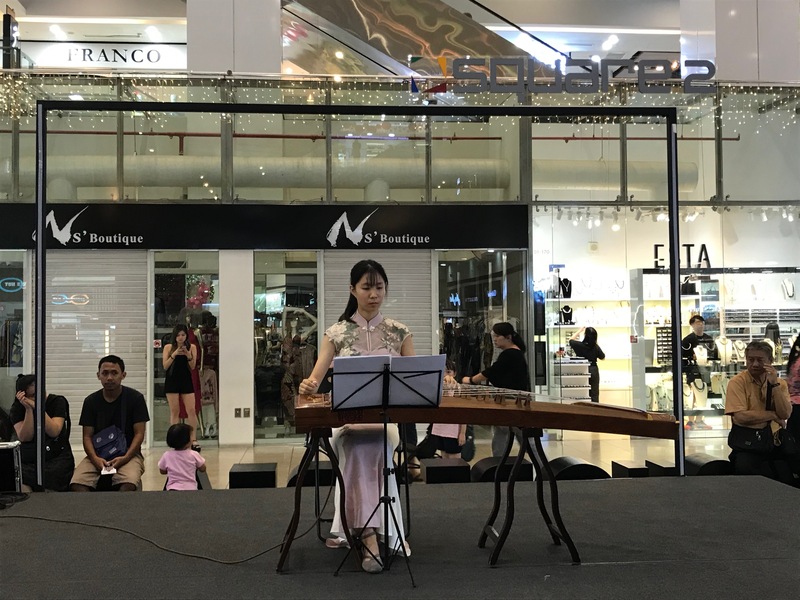 We had 2 sets at Clementi Mall with a trio of Guzheng Pipa and Dizi on a Saturday afternoon. It was a busy day at the mall and a lot of shoppers stopped by to have a listen. Our Guzheng Pipa duo performed at Sembawang Shopping Centre as part of their new year activities. The 2nd time we are doing for this company. 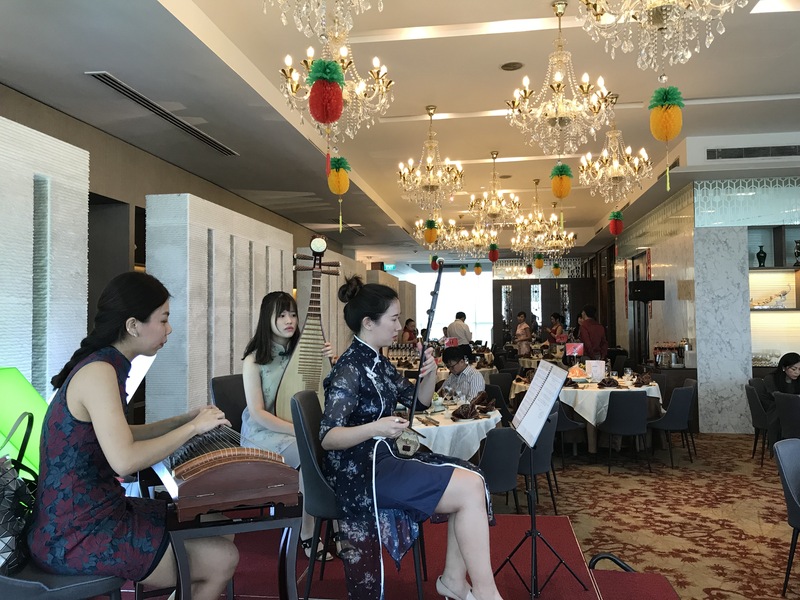 The music added a festive ambience for their Chinese New Year lunch. We were invited again for a Lo Hei CNY lunch of a listed company. We had to change multiple passes, get on a mini bus in order to get to our final destination. 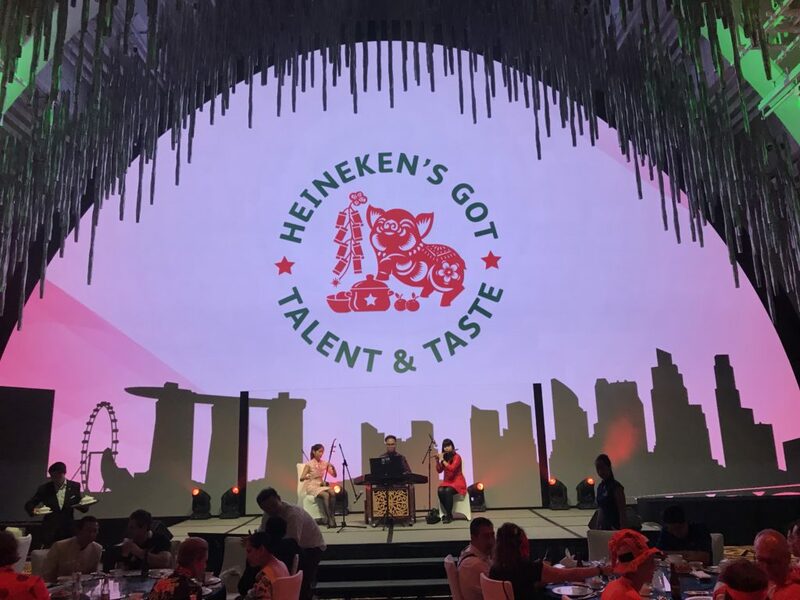 Our trio of Yangqin Dizi Erhu performed at a glitzy Chinese New Year dinner of a beer company. 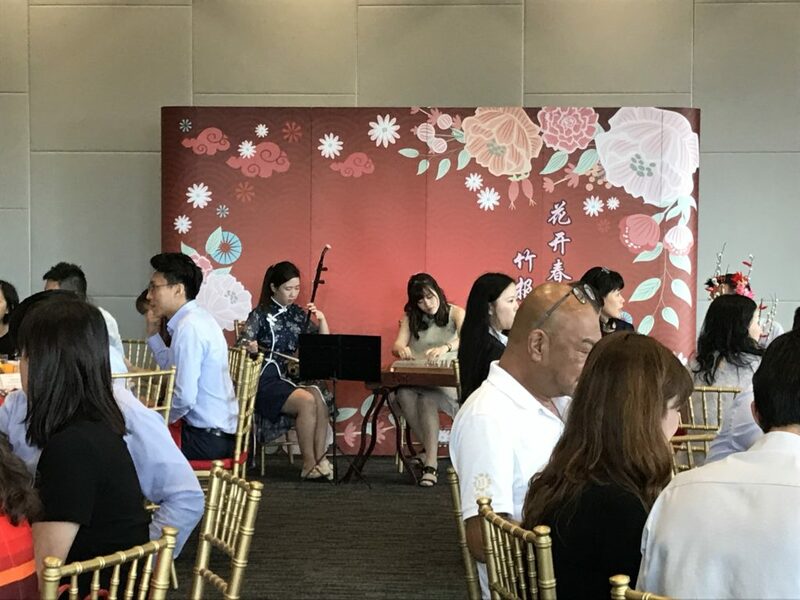 Another CNY gathering that needs some traditional Chinese music. 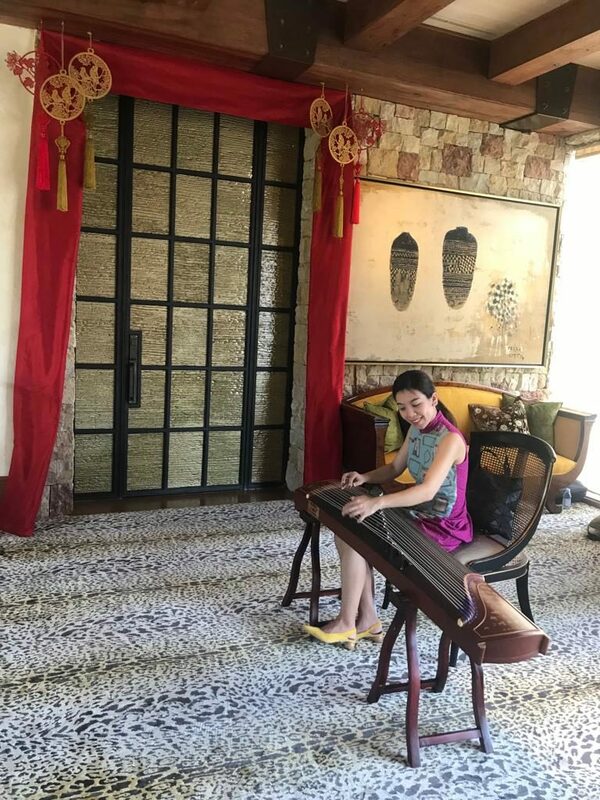 A little Guzheng solo at a really huge house. 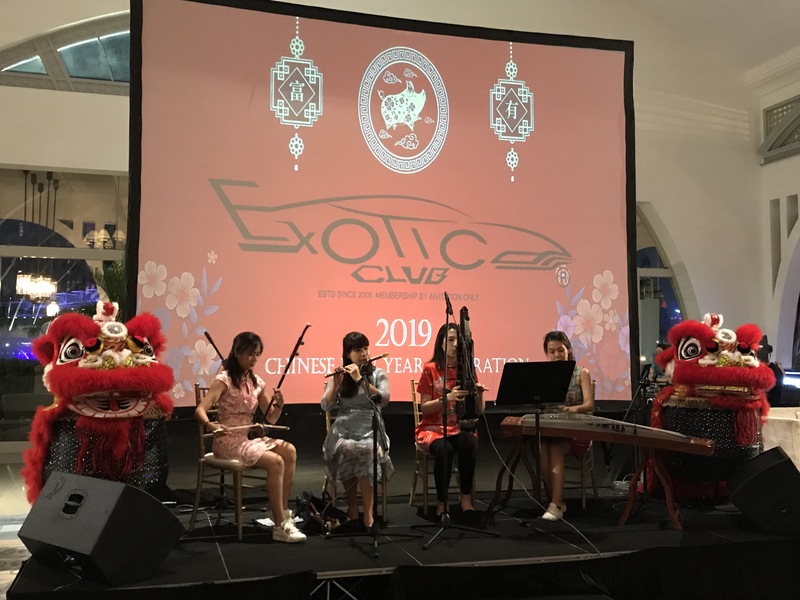 A Chinese New Year dinner performance for Exotic cars club by our quartet of ladies. 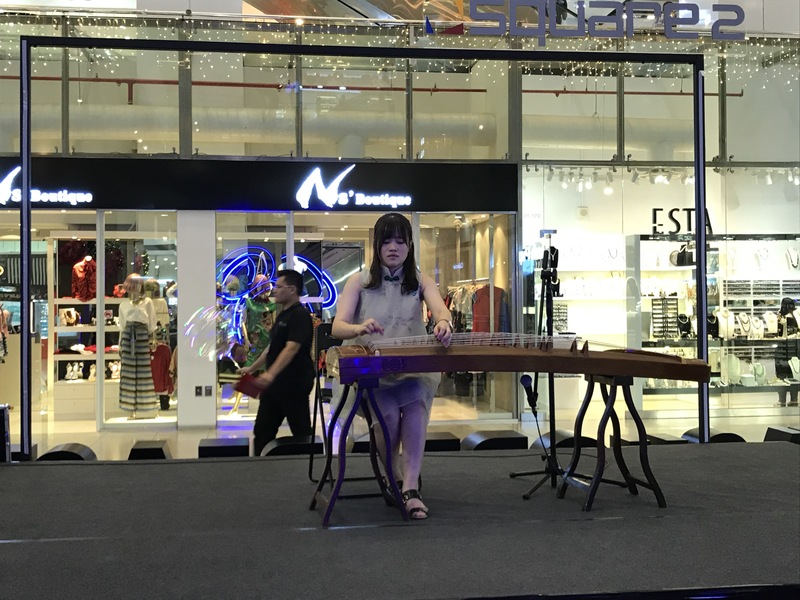 The Sheng made a rare appearance with Guzheng, Dizi and Erhu. The music was as good as the food! 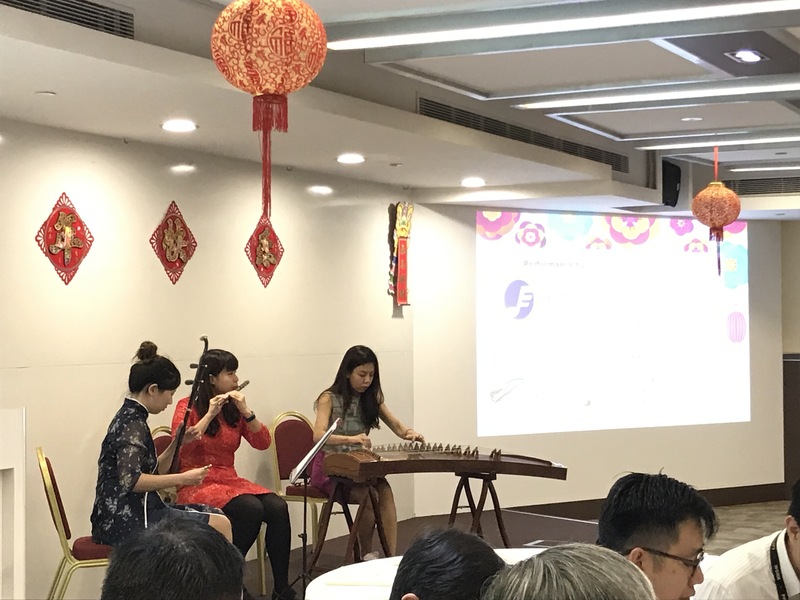 For the 3rd year running, we performed for a series of Lo Hei lunch for Ascendas and their partners. Yes another performance for a corporate lunch for a real estate company for the third year running. 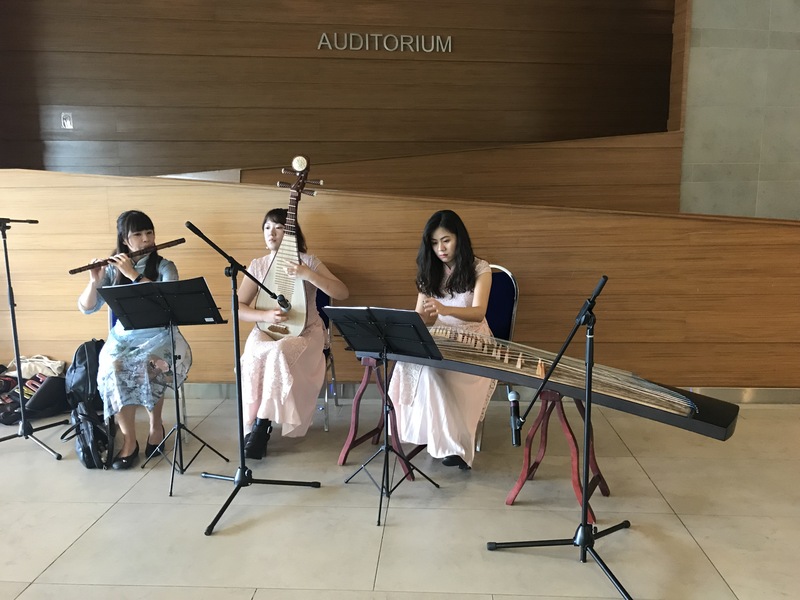 They always like our Guzheng and Pipa performance. 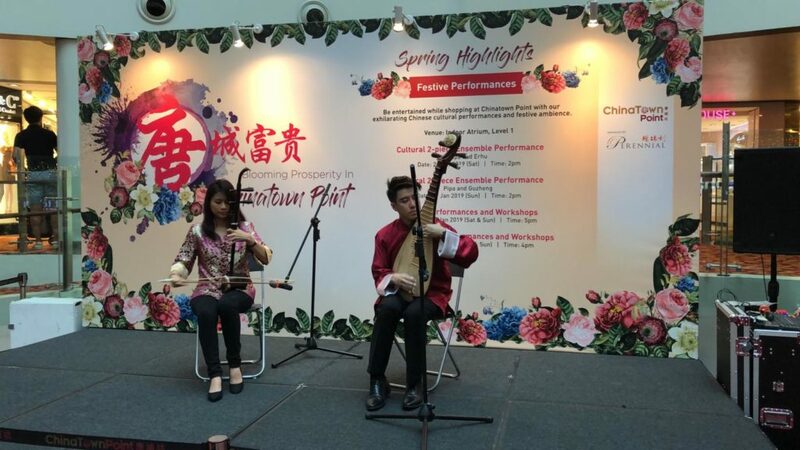 Our trio of Guzheng Pipa and Dizi performed for another Lo Hei session for doctors and nurses at NUH. 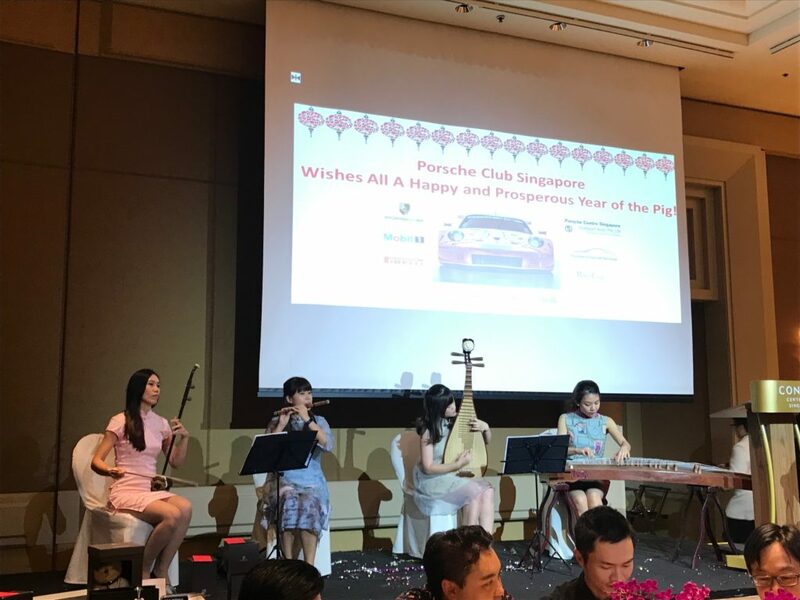 Our all girls quartet had the opportunity to perform for the Chinese New Year Dinner of Porsche Club. 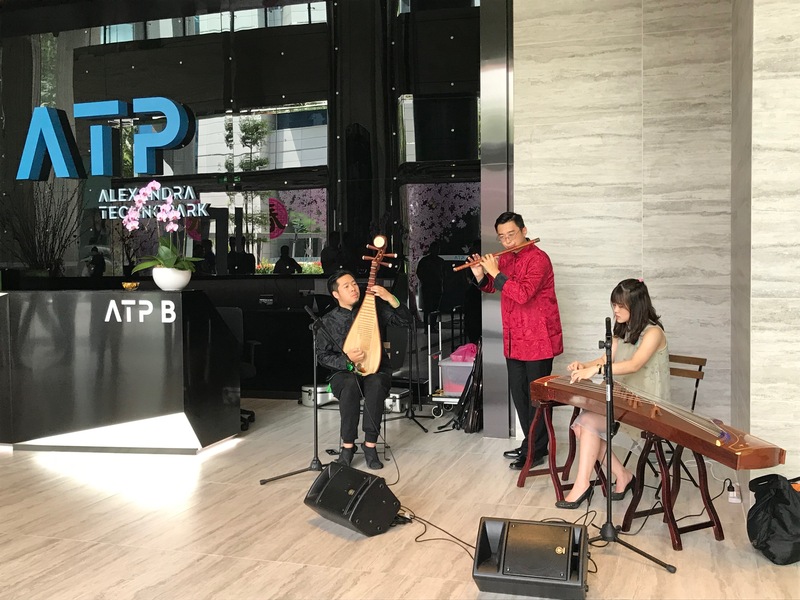 The night was long hence we got our most versatile players to entertain with Chinese New Year songs, Chinese pop as well as English pop. This performance took us almost all the way to Tuas second link. 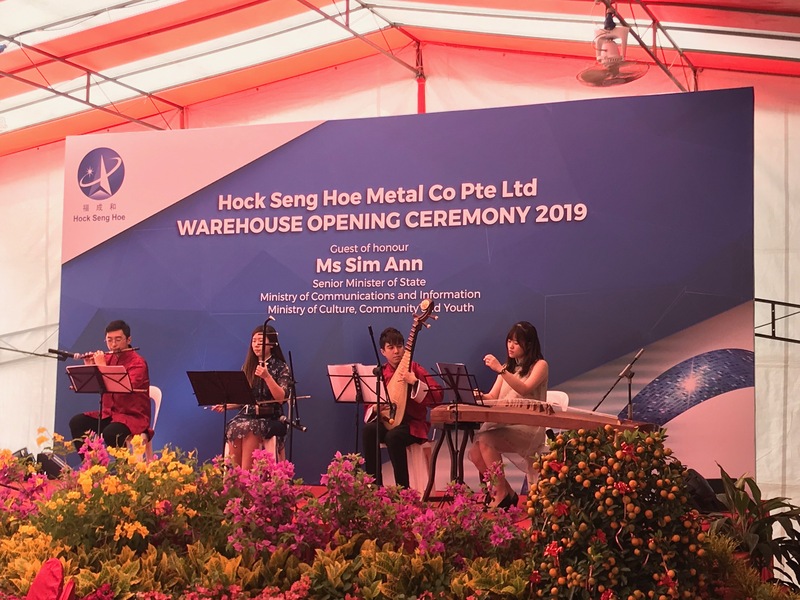 It was the opening of a steel factory and Minister Sim Ann was the guest of honour. The owner of the steel factory loved Cantonese tunes and specially requested for tunes such as 半斤八两 and 海阔天空. 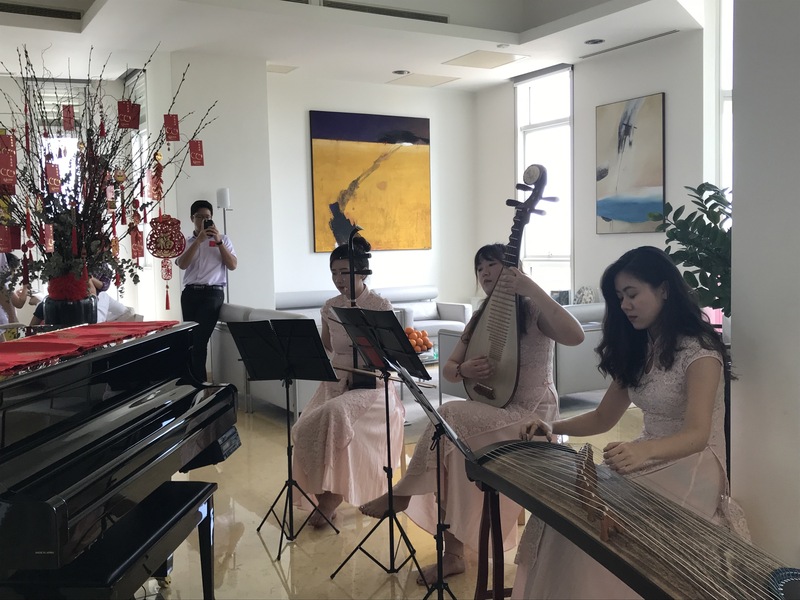 Someone contacted us regarding a private Guzheng performance at his home. 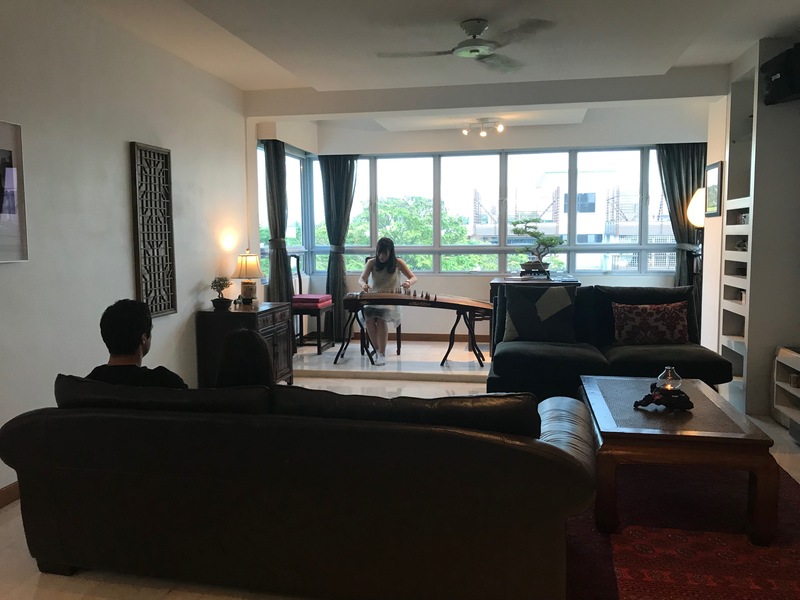 It was his wife’s birthday and she loved the sound of the Guzheng. 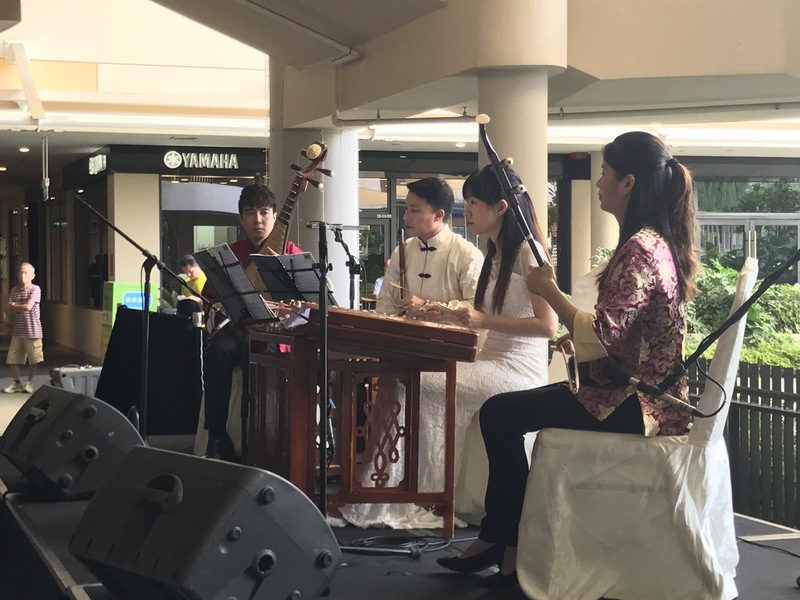 Our Guzheng solo performer played some classic Guzheng tunes like 彝族舞曲， 战台风 followed by some familiar 邓丽君 tunes for just the two of them. 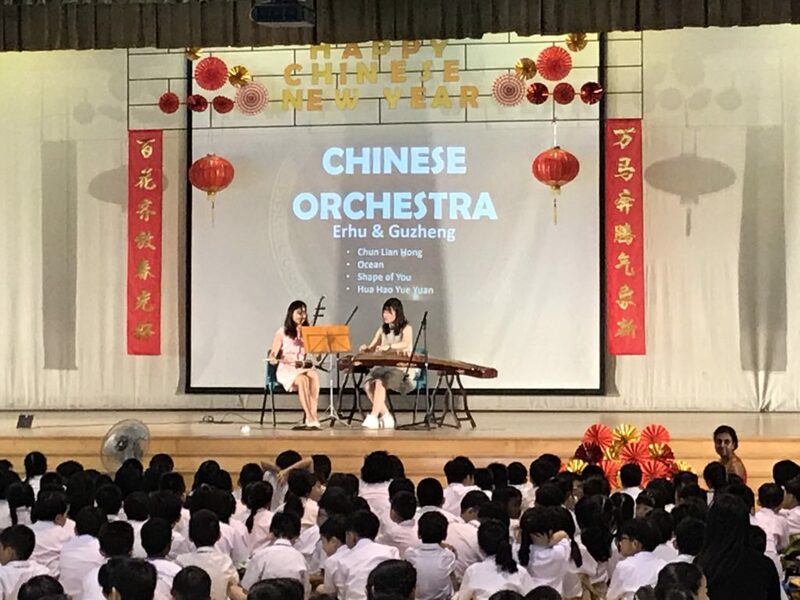 The last performance for Chinese New Year 2019 was at Hometeam NS Bukit Batok campus. They had a Chinese New Year dinner and had some lion dance opening. 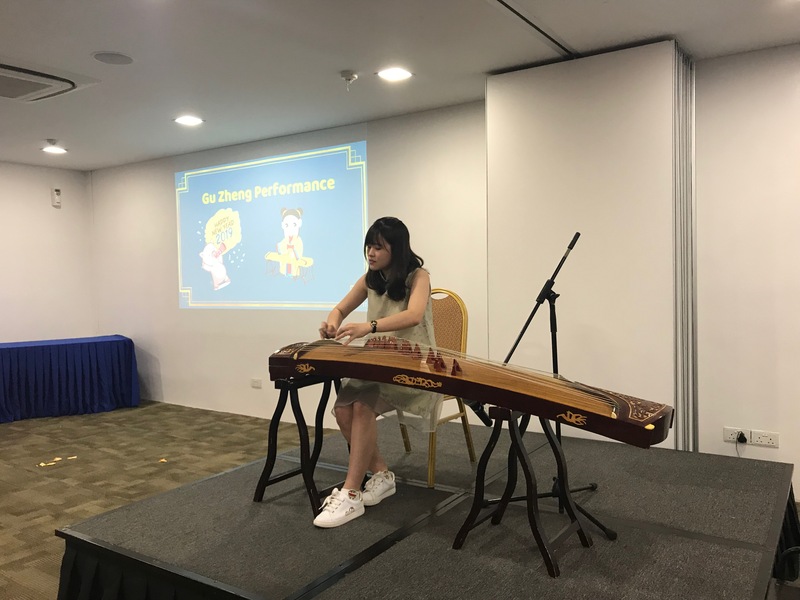 We entertained throughout their dinner with a Guzheng solo performance. And that wraps up our performances for Chinese New Year 2019. If you have any event that needs live music, do drop us an email at [email protected]. 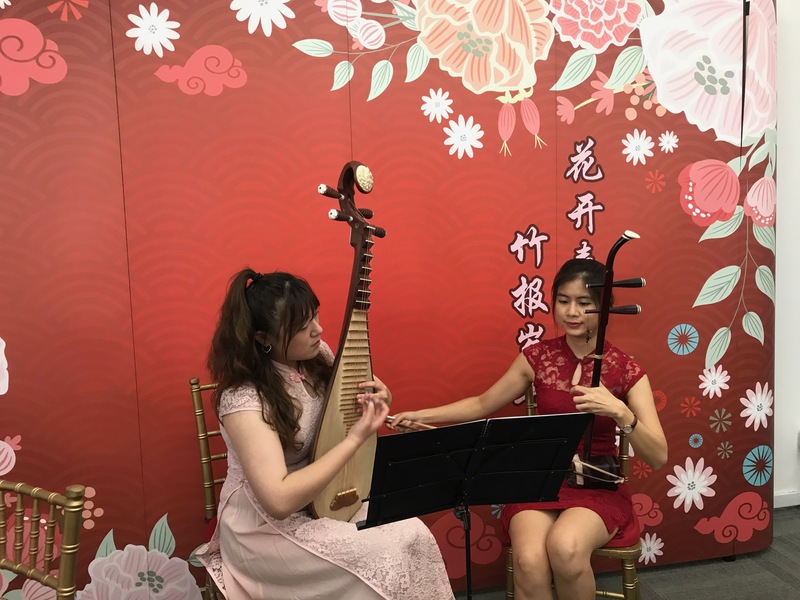 Chinese music instruments can play all genres of music hence you do not need to wait till Mid Autumn Festival or the next Chinese New Year!